She had been the star of her generation. The Tamassaran that had raised her, and a set of six other children, had high hopes for her. Not graced enough to be born without horns, but she was witty, intelligent, dedicated, shrewd. While the other children would push each other around, she would simply watch. Or chide when they got too rough too near her. Thus, when it was time to assign her a role in the Qun, the Tamassaran had placed her in the Ben-Hassrath. A Salit, no less. For many years, her life was as one would expect under the Qun. Born and raised in Kont-Arr, much of her time was spent educating new believers. Rivaini people who through different means had come to be interested in the Qun and its way of life. Over time, she came to understand much of their ways as well. The once rigid, reprimanding young girl learned just as much from her converts as they did from her. Always with a purpose, though. Always with meaning. It became easier and easier for her to teach the new initiates, as she could explain the differences between their ways and her's. She taught with love, with understanding, with acceptance, offering a place of home and reason. The problems arose when she started to care too much. It started as little things. Pangs of sadness when those under her tutelage needed to be classified as failures. Joy at seeing certain people. Remembering names. And then… There was a woman with eyes like the sea. She was smart, demure, a delightful conversationalist… They would get to speaking at the end of lessons, and before she knew it, the sun was threatening to rise. Syreeta, her name was. She'd liked the name, the way it sounded, how it felt in her mouth. She could say it over and over and it never grew old. And there were some nights where she did, though such daliances were not permitted within the bounds of the Qun. 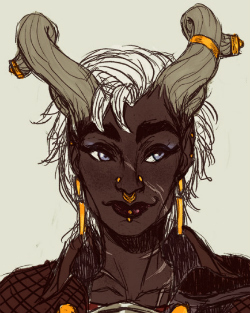 But the Qun had always been what made sense, had been beautiful, had been comfortable, peaceful. This too was all of those things. Love was warm and beautiful, physical intimacy made sense, it was comfortable, it brought peace. How could these two things no co-habitate in her life? It didn't make sense. And when Syreeta was found with another lover by another of the Ben-Hassrath, and was made Viddith-bas, she could see no purpose in it. Everything she had ever done for and in the Qun had made sense, had purpose. This, she could not cognize as anything other than a breach in the very foundation of her faith. It shook her to her core, and much of the beauty that she had seen in the Qun fell away. She had two choices. Turn herself in for re-education, or leave. What had been done to the woman she had come to love, however, made her sick to even think of… So she left. Ran. In her flee, she was staking herself as a Tal-Vashoth, she knew that. But what she had lost made a hole in her heart that the Qun could not fill. Fleeing South, she took on her lover's name for herself: Syreeta, as a way to always remember why she had left and what she had lost. Skilled in a great many tasks, she made her way across Rivain doing odd jobs. And when she hit Dairsmuid, she took up work on a ship's crew. For months she worked in Rialto Bay, and it was good. A ship's crew was not so unlike the Qun. Everyone had a place, and they knew it. They did their tasks for a larger goal, and together they kept a ship afloat and on course. It was rewarding, in its own way. Though she was just a tag along, doing work to earn her keep, it was enough. When their trade route took them even farther South, though, toward Kirkwall, it was the farthest Syreeta had ever been. It was also when the Captain would be taking on crew he had given a few months leave there. There would not be space for her, it was her stop. Pulling into the harbor, Syreeta needed only see the Dreadnaught at a distance to know what it meant. But there was no arguing with the Captain. Some of his crew he was picking up would be no great fan of hers, Tal-Vashoth or no. She needed to go, Antaam in the city or no. So now, she's just trying to lay low and see what exactly it is that has the Body of the Qun in Kirkwall.